There are so many things that begin with s that I really had to narrow it down to just six for this worksheet. 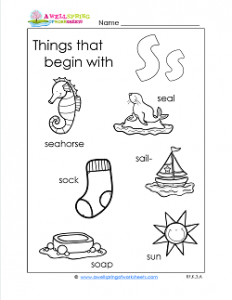 The pictures I chose are a super cute seahorse, a silly seal, a sailboat, a smiling sun, a simple boy’s sock, and a bubbly bar of soap. Kids can read the words (with your help and the help of the pictures), find the s in each word and circle it (hint: they’re at the beginning of each word! ), and color the pictures and the letters.